Do you read your horoscope every day? Are you always judging people based on their astrological signs? 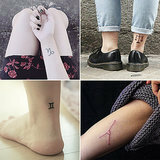 If you’re looking to get new ink and totally into studying the stars, chances are a zodiac tattoo would be perfect for you. We have selected a beautiful design for every sign in the year. Check them out to get inspired!